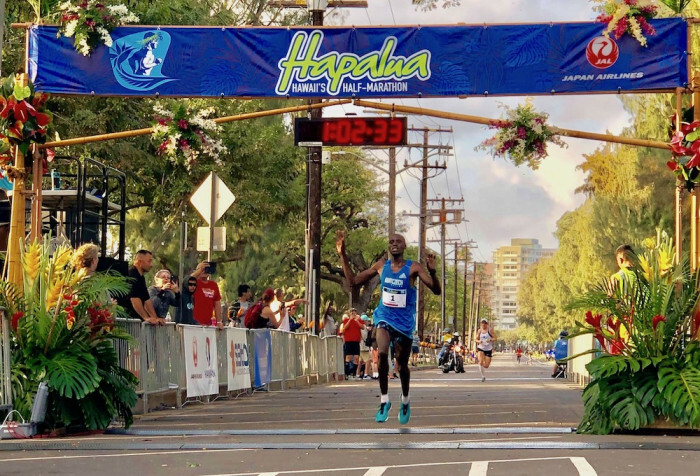 Josphat Tanui from Kenya passed all 24 members of Team Hawaii on his way to victory at the Hapalua Chase. Cindy Anderson, Oahu, held out longest and was beaten just 50 yards from the finish line. Cindy started 19 minutes ahead of the two invited Chasers. Matt Holton, representing Maui came in third in a Chase time of 1:03:02 (total time 1:15:02). Matt held off the second Chaser, Mike Chesire.